One of the qualities I like best about yoga is the fact that I can take it with me so easily when I travel. Yoga does not require special equipment. I always pack “workout clothes” and only a small space allows me to practice just about anywhere. It’s a great cure for jet lag, and I’ve found that by stretching slowly and mindfully I can nourish and refresh the muscles and organs in my body after a long flight. As Jacqueline Gifford, special projects editor for Travel+Leisure discussed at the game changing Le Miami conference recently, only 51% of employes use their vacation time. “People need to switch off or they are going to burn out.” Embracing the unplug concept, destinations and hotels are offering yoga retreats around the world. Find your namaste at one of these 10 international eco friendly yoga retreats. Wellness travel represents part of the new definition of luxury. Travel can be stressful, getting there has become one of the no-so-relaxing parts of the journey. Choosing a vacation that revolves around yoga, healthy eating and mindful travel will allow you to press the reset button. You’ll end up relaxed, centered and in tune with your body, mind and the environment, ready to conquer the challenges ahead. The El Conquistador Resort & Las Casitas Village, Waldorf Astoria Resorts in Puerto Rico was recently honored for its commitment to environmental conservation. They offer a three-night wellness retreat throughout the year on their sustainable property. Spa/yoga packages are named after the 4 elements: Air, Fire, Earth and Water and combine cross training activities for a full experience. Choose from beach workouts on the resorts 100 acre private Palomino Island or zip lining in the nearby El Yunque Rainforest. Combine yoga with a bio bay tour to the luminescent waters and finish off with a hot stone massage. Find your zen while meditating in the outdoor labyrinth. Farm to table cooking classes use locally harvested ingredients and herbs from the resorts garden. Raw food or juicing are two of the healthy options for meals. 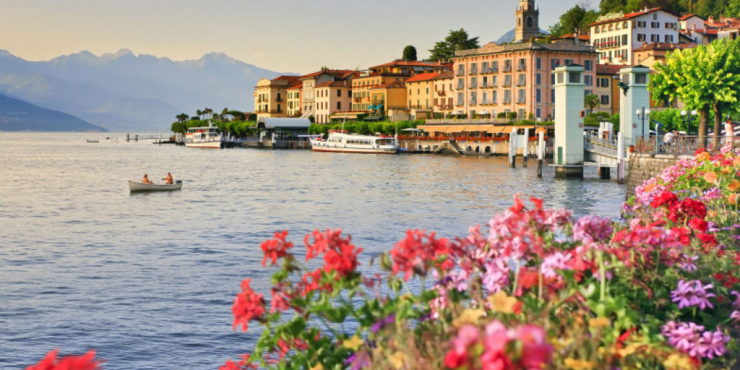 Escape to Shape offers fabulous luxury getaways in exotic destinations around the world. While I’d be hard pressed to make a choice between Peru, Bhutan and Morocco, I think Marrakech is an ideal spot to focus on wellness. You’ll be staying in a Moroccan style villa perfectly situated between the Atlas mountains and the medina. Along with the cultural and natural wonders, guests can enjoy an invigorating yet relaxing(is there any other kind?) hammam, meandering through the marketplace, belly-dancing lessons, a camel trek through Berber villages and a cooking class on how to prepare traditional Moroccan cuisine. I can’t think of a better place to learn about new exotic ingredients and healthy cooking in a tagine than the local market, Jemma el-Fna. The hyper frenetic pace of life here will leave you in a receptive space to embrace your yoga practice and quiet the mind. 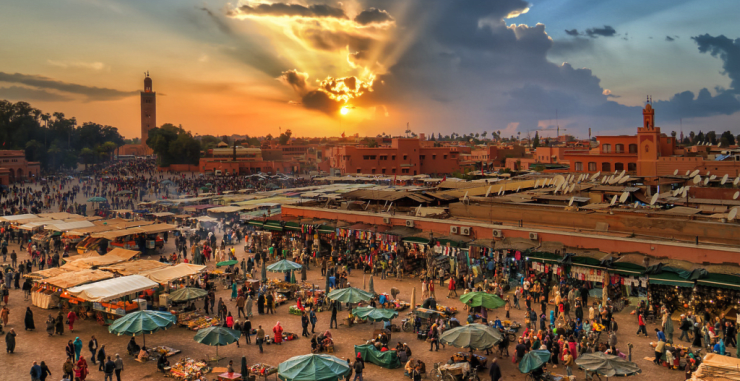 You’ll be happy you’ve strengthened those biceps during the week, as no doubt after visiting Jemma el-Fna your suitcase will have gained a few pounds for the ride home. Prices begin at $4000/7days. Having completed over 75 wellness retreats in 25 countries, Grace Van Berkum is an expert in the field. Join Gracious Living Lifestyle for a superfood-themed week-long yoga retreat in Nicaragua. Each day enjoy organic, clean, fresh foods from the earth to complement yoga classes. The specially crafted menu will include fresh juices, plant based smoothies, plant proteins, medicinal mushrooms, adaptogenic herbs, organic fresh vegetables and fruits grown from the on-site garden and greenhouse. This healthy menu pairs perfectly with daily lectures led by a holistic nutritionist and anti-stress coach. De-stress while staying in eco-chic cabañas nestled among beachfront coco-palms not far from the water. This week long retreat takes place at different times during the year and rates start at $2,084. You might have noticed I’m a fan of outdoor bathtubs. 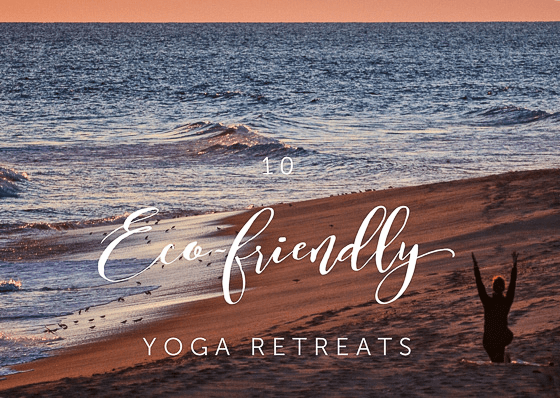 Combine that with Outlander fever and you can bet this retreat from ecoYoga Scotland is high on my radar! Now in their sixth year, the tranquil river-side retreat in the Scottish highlands, is dedicated to teaching Yoga along with sustainable eco living. Owners Nick and Rachel have created this retreat at Inverliever Lodge as an expression of their eco friendly lifestyle. Set in the magnificent Scottish landscape, the turbine and solar powered escape is a model for a luxurious carbon free living. In the off the grid studio, overlooking the gorge of the River Liever, you can learn the art of yoga from some of the finest yoga teachers in the world. The 60sqm shala is built with under floor heating and a very calming ambience. Your body can melt into the warmth of the floor during Savasana (yes I admit, one of my favorite poses at the end of a Yoga practice) whilst the mind is gently soothed by the sounds of the nearby waterfalls. There are several bathing areas and showers to choose from. Inspired by the Japanese tradition of the ‘Sento‘ or public bathing house you can soak in natural wooden hot tubs in the Dome, or choose some hideaway bathing spots in the forest or river bank. Food comes straight from the seasonal organic garden, emphasis on delicious vegetarian dishes. Retreats are run throughout the year and you can find more details the retreats page.